Lime, rum, and sugar. It should be old hat by now (see the daiquiri post for a refresher if it isn’t). Let’s see what difference some mint, some bubbly water, and a tall glass makes. We are staying with the Cuban heritage, but the Mojito is a whole different beast from it’s hard drinking cousin the daiquiri. 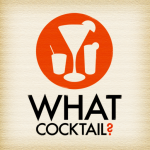 Some purist may argue that this isn’t a real cocktail – ignore them. In fact many fine drinks are served in a tall glass. Don’t let the glassware fool you. Not all cocktails come in a martini/cocktail glass. There’s a couple of benefits to this. On the lazy days of summer having a drink to linger over is certainly very pleasant. And if we are lingering, we need to keep things cold. A tall glass filled with ice does this better than anything we care to mention. So, what should a Mojito taste like? Where the classic daiquiri is sharp and to the point, this drink is more refreshing than thirst quenching. 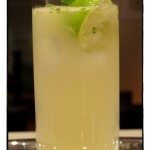 The mint provides a fantastic aroma and keeps the flavor coming as the drink sinks lower. 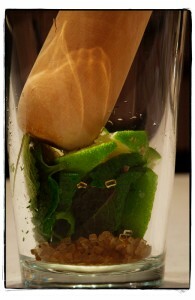 A well made Mojito is muddled. No seriously – that’s what it’s called. Bartenders who take their craft seriously, and respect tradition will be using a miniature bat to grind up the sugar, limes, and mint into a syrupy paste. This makes for some great entertainment. Then in goes the ice and rum. Some places will shake it up, others may make in the glass they serve. It’s probably not worth getting hung up about which method is used. In any event, the whole concoction is presented in tall glass, topped with soda water and garnished with mint and the the hull of a lime. It should be a graduated green colour with lots of suspended small particles of mint. It should smell exquisite. 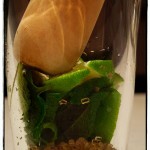 The Mojito is a fantastic drink if you are undecided when ordering something from the bar. It will give you a sense of how seriously the staff take their drinks and it will give you a great talking point with your friends. “Look, my drink has mint in it! Can your beer do that?” As for the taste experience, expect it to change during while you are drinking it. It’s natural for the more dense sugary water to settle in the bottom of the glass. As the ice melts the balance will change. In many ways the third or fourth sips are the best followed by the sweet last, and undignified, slurp that leaves you wanting more. 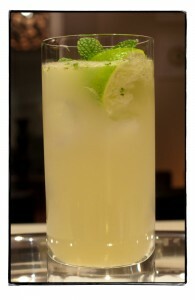 If you like the taste of a Mojito, there’s lots a whole family drinks, know as “collins” to explore. Don’t expect mint in any of them but they could be a gateway to some more interesting spirits.